The U.S. patent for an "ultra-rapid air vehicle and related method for aerial locomotion" was awarded to Airbus, also known as the European Aeronautic Defence and Space Company, in July. Airbus said the plane would be targeted mainly at business travel and VIP passengers "who require transcontinental return journeys within one day," and at the military. The document states that the supersonic plane could carry 20 passengers or two to three tonnes and reach up to 4.5 times the speed of sound (Mach 4.5) — around 5,500 kilometres per hour. That would allow it to fly about 9,000 kilometres from Paris to San Francisco (currently an 11-hour flight) or Tokyo to Los Angeles (currently a 10-hour flight) in three hours, the patent says. Observers such as Deepak Gupta, founder of the Gurgaon, India-based intellectual property drafting service Patent Yogi, have remarked that at Mach 4.5, the plane could cover the 5,600-kilometre distance between New York and London, normally a seven to eight hour flight, in an hour. However, that doesn't take into account that the plane wouldn't be at its top speed for the entire duration of the flight. The plane would achieve its extreme speed with a combination of three sets of engines — turbojets for taxiing, takeoff and landing; a rocket motor for rapid acceleration; and ramjets for high-altitude cruising. The turbojets and rocket motor fold into the body of plane when not in use and the plane also has adjustable fins to make it more aerodynamic. It would be fuelled by hydrogen and liquid oxygen. The Concorde, built by Aerospatiale and British Aircraft Corp. The Tupolev Tu-144 or "Charger" built by Voronezh Aircraft Production Association. That caused Gupta to describe it as a "supersonic roller-coaster" in a video featuring the new patent. If you're eager to give it a try, don't get too excited yet. When asked about the patent, Airbus said it files for hundreds of patents a year. "These patents are often based on R&D concepts and ideas in a very nascent stage of conceptualization, and not every patent progresses to becoming a fully realized technology or product," the company said in an emailed statement. "Therefore at this time, we will not be providing any interviews or further information on this topic." 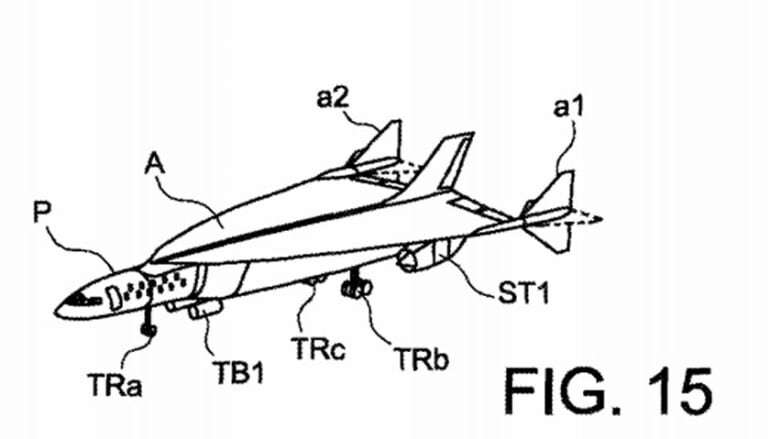 Airbus has filed other unusual aircraft patents in the past. For example, last summer, it filed a patent tobicycle-style seats on planes that would make it possible to cram more passengers in the same amount of space. And last fall, it patented an aircraft cabin shaped like a giant flying saucer.